Nephew update: He has a job at Mc Donald's. I shipped 3 boxes and his golf clubs for arrival on Friday (Note to self, never ship golf clubs again. Too expensive.) There are 6-8 more boxes but I am going to wait to ship them until he asks for them since some things should be shipped straight to college in August. His grandfather is trying to convince him to buy a laptop instead of a gaming computer. I'm staying out of it. That's about all I know. He doesn't communicate much so I'm going to assume that no news is good news. Now that I'm not worrying about my nephew's whereabouts, meals, homework, screen-time, etc... my brain has so much time to think about all of the things I've been putting off. 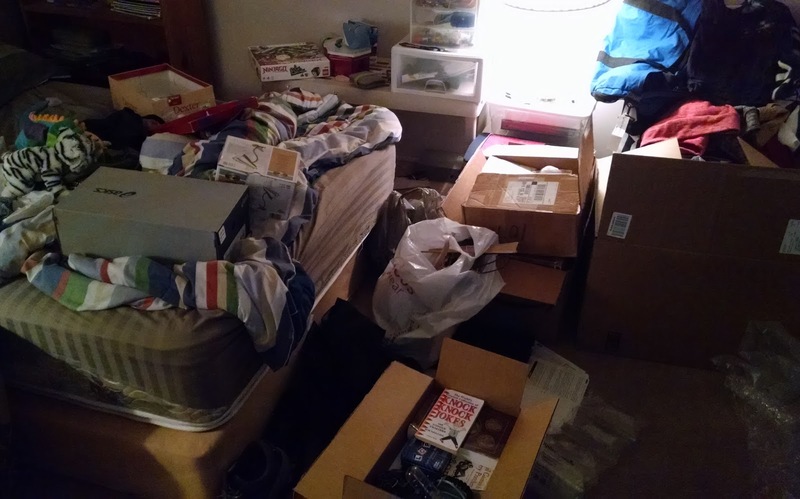 I threw out all of the trash in nephew's room and put 85% of the stuff in boxes on the bed which I have left open so that I can find things. I cleaned out any food that I bought for nephew and that I don't want to eat like Kraft Mac and Cheese and Hamburger Helper. I'm going to drop it off at my tenant's house along with a big bag of dog food donated from the dog rescue and a table top bbq with leftover charcoal. I'm really not the bbq type. Today I took a half day off to wait for the water delivery truck to deliver 3,500 gallons of water to my new tank at the mobile home/barn-shed property. The guy filled my 3,000 gallon tank, then put around 300 gallons in another tank. Then I thought we could empty the truck into the 300 gallon tank but when it was filling, suddenly water started pouring out. 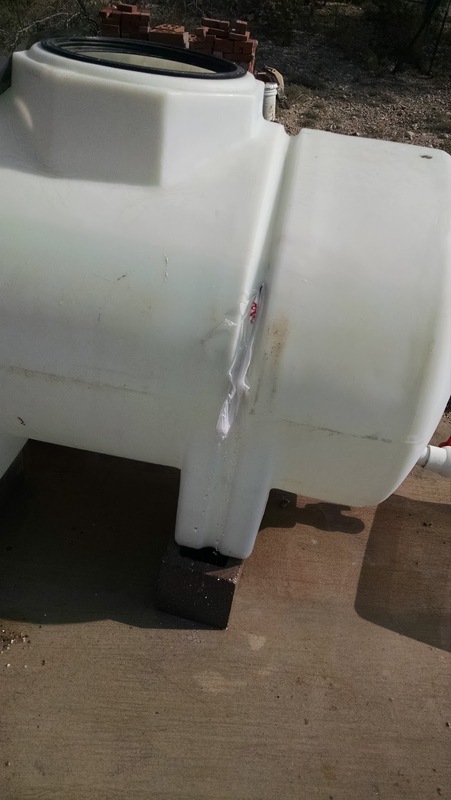 There was a 2 foot crack starting halfway around the tank. Dismayed, I tried to think of how to save my water and ended up stuffing a plastic grocery bag inside so that it poked through the crack and slowed the leak to a trickle. I wasn't planning on having to transfer water today but it was clear that it would leak out if I left it so I set up the pump and hose. 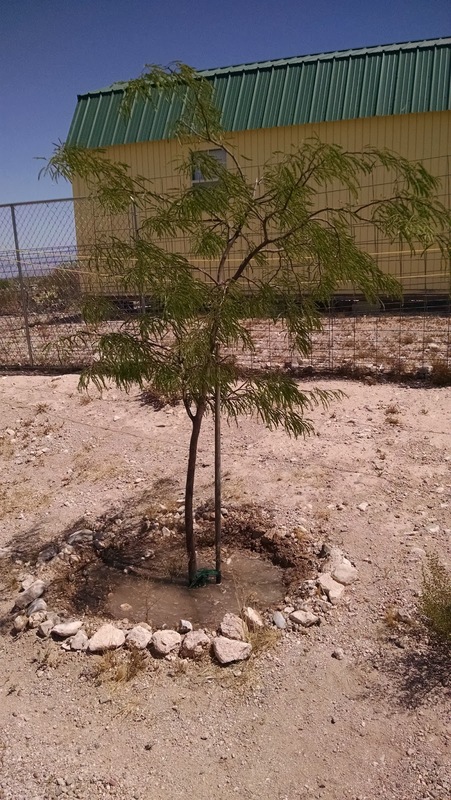 I suspect it got cracked when the neighbors helped my tenant get water when he was living here. They took the tank in the back of their pickup and it looks like it was shoved out too many times. The tank was very old and brittle so I'm not surprised. I'm going to try to repair it and still use it for rainwater collection like I had planned. Crack in tank with temporary plastic bag fix. While I was waiting for the water to transfer to the other tank, I dropped off 3 bags of clothes and 1 box of toys with a friend. She'll find a new home for everything. I stopped at Dairy Queen for a hot dog and drink and drove back to finish up the water transfer. As soon as I pulled up I realized there was something wrong with the car and, sure enough, the passenger side tire had a side-wall gash. Not wanting to use the cheap car jack on gravel, I called AAA. I figured they would arrive by the time I finished transferring the water. Unfortunately, they got lost and I ran out of drinkable water (I wasn't expecting to be there that long). Next time I go out to there I must remember to bring reserves. It was 105F out there. Too hot! I miss not having a refrigerator there since I moved it to the rental house but I will bring the fridge from my house as soon as I find a nicer replacement. At least I had a window A/C which I stood in front of whenever I wasn't moving stuff around outside. AAA arrived and changed the tire and I drove slowly to the tire shop. A coworker picked me up so that I could spend 2 hours going through my email. I'm going to have a lot to do tomorrow to catch up. My coworker dropped my off at the tire store on the way home and I was pleasantly surprised to find that the tire was under warranty and they only charged me $10 for labor. That was a relief. I'm glad I am safely at home now and I have crossed a few more chores off of my list. Here's a layout of my property so that you know what I am talking about. This is not where I am currently living, it's just used for storage at this point, but it is where I hope to retire someday soon. I put the water tank on the hill to use gravity to my advantage and for ease of filling. Eventually, I would like to have all rainwater catchment but I don't have enough roof area yet. 1- Shed. 2- Mobile home. 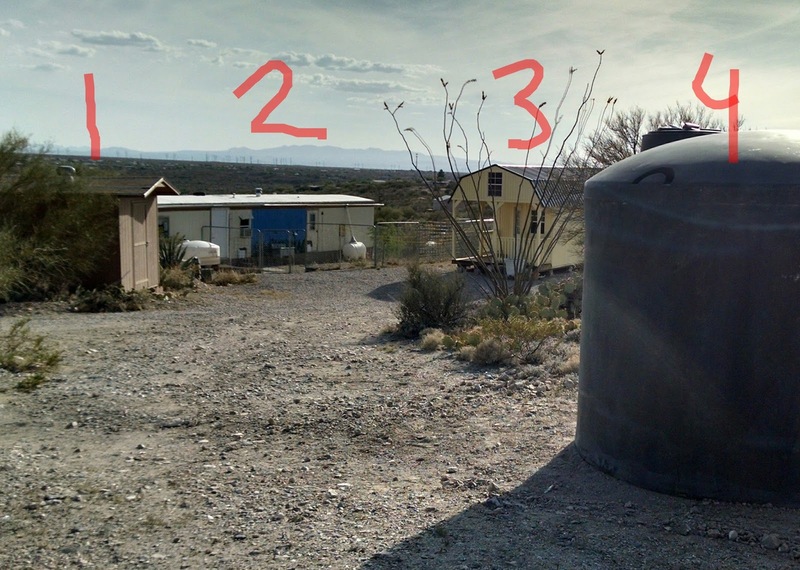 3- Barn-shed (someday tiny house) 4- New water tank. 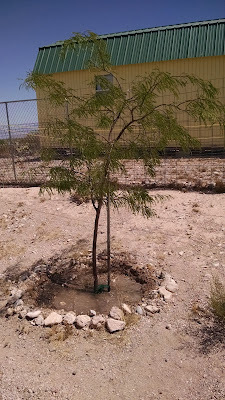 This is the memorial tree for my father that my coworkers gave me almost two years ago. It has more than doubled in size. 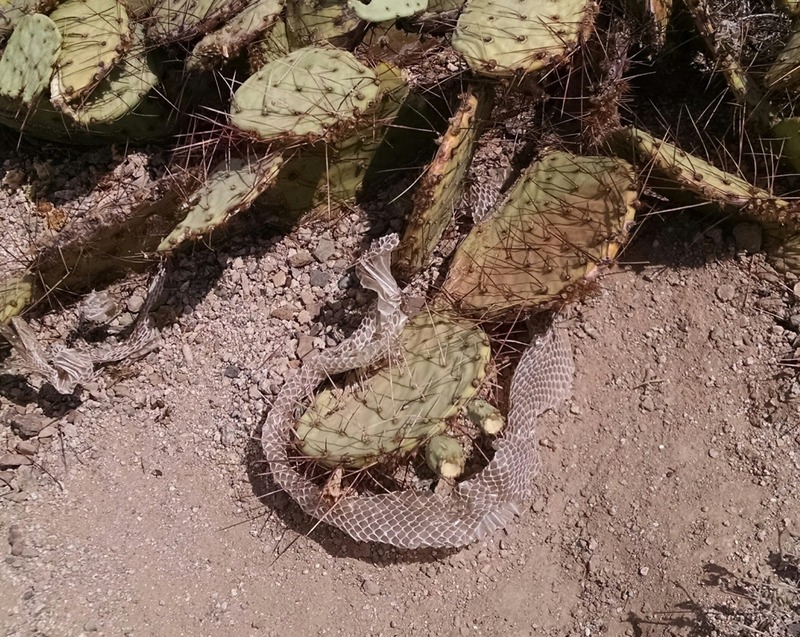 Just a reminder that the rattlesnakes are nearby in case I forget. This was under the water tank when we tipped it up along with a fat packrat. -Bring food and bbq to tenant. -Pick a day to go look at houses with Mom. It's nice to be making progress. I'm having a deja vu attack, Daizy! 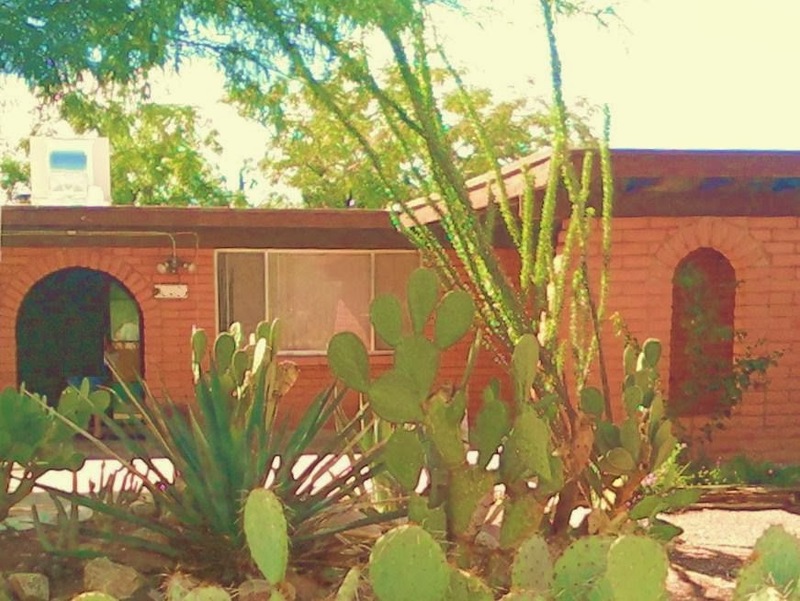 More stories about leaky water tanks and critters at your old property? The fun never stops, my dear Daizy! I know, I know. One day I will have the time and money to make it comfortable, That's the plan anyway. It is still far from that. I am all excited. I will come visit with the paint brushes and hammers. Then i see the snake skin and I think naaaahhh! I felt the same way when I saw it and the rat. Same old nemeses. Is that the plural of nemesis? Yes, Daizy, nemeses is the plural of nemesis. Good reminder to keep a gallon of water in the car this time of year. You never know when you might be stranded for a while! Love the plan to get all your water from roof collection. I wonder if creating a lean-to would help (shade and additional roof)? Oh yes, I had a half bottle of water in the car that I was sipping. Not nearly enough. Yes, lean-to's are definitely on the list. I think they would be easier than trying to attach gutters way up high. Bring them down to my level. As long as the wind doesn't tear them off.